The CKT2175-10 is a low cost, 250 VDC, high-speed, benchtop wiring testing system. The basic system includes 1,000 test points and is housed in an enclosure 20.5 in. (521 mm) wide X 12.0 in. (305 mm) high X 16.05 in. (408 mm) deep. A second 1,000 test points can be added by increasing the height of the enclosure by 5.25 in. (133 mm). The Measurement Control Unit (MCU), along with the required power supplies, takes up 3U of the 6U panel height of the enclosure. 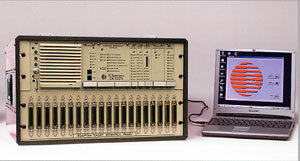 The MCU contains the voltage / current generator required for the continuity / insulation test stimulus generation, the measurement instruments, the switching matrix drive logic, plus the micro-computer (PII) test control engine. The CKT2175-10 control is via a standard desktop or notebook PC, which is interfaced to the PII test control engine by a standard Ethernet LAN connection. Continuity (opens) testing to 50mA at a compliance voltage of 100 VDC. Resistance measurements to < 1 ohm. Short testing to 100 megohms at voltages to 250 VDC. Opens testing at > 5,000 tests / second; short testing at > 1,000 tests / second. Bi-polar, solid-state switching matrix that is immune to destructive ESD effects. The Graphical User Interface (GUI) is available in multiple languages (English, German, French, Italian, Spanish and Chinese) and provides for intuitive operator interaction. The system can be programmed for tests using the standard CKT programming language or by the internal self-learn mode of operation. The CKT2175-10 is an ideal wiring analysis system for those test applications requiring less the 2,000 test points, and test voltages that are not in excess of 250 VDC. This system also provides an excellent solution for those Users needing to integrate test electronics into their mechanical handling equipment.